We had stopped working on the loft closet for a while. Then, on a road trip, we were at Home Depot looking for some garden sprinklers. 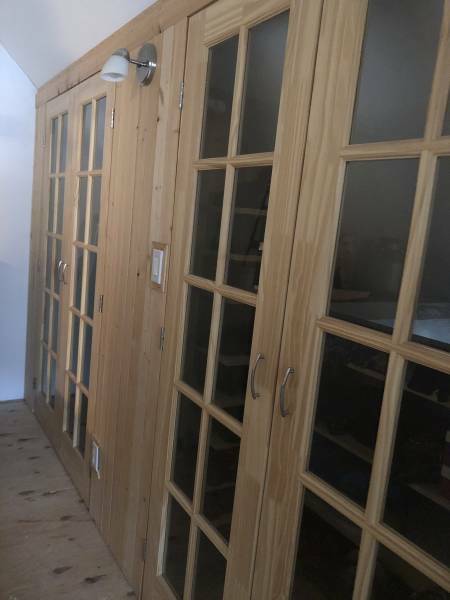 Graham spotted a sale on glass paned wood doors and we thought they could work well for the closets. We measured them up and decided they would work! We got them for a great deal ($52 per door). So we bought them and were inspired to get going on the second part of the loft closet project. Hey! Have you read the first part of our Closet in the Loft build? You may want to read that one first then come back to this second part. It turns out the hardest part of the door install was not actually installing the doors. The hardest part was definitely carrying these heavy doors into the house and then up the stairs. Four heavy doors. I needed a break after that! It didn’t take Graham long at all to get these new doors mounted. He had to do just a bit of shimming to get them fitted properly. 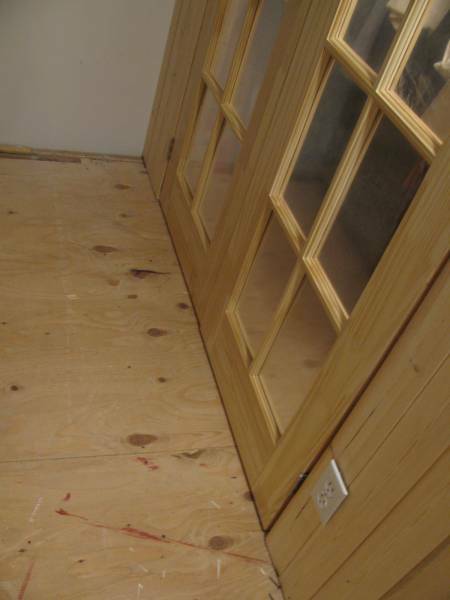 The doors were mounted in minutes. This is where accurate measuring and a package of shims works wonders. We are really happy with the way they look. The closet is turning out better than I had hoped. Just wait till that one empty closet is all planned out and installed! And now we can finally uncover all our hanging clothes. We had old bathrobes draped over them to protect them from the dust. A few small details – a bit finicky but part of the trim work. 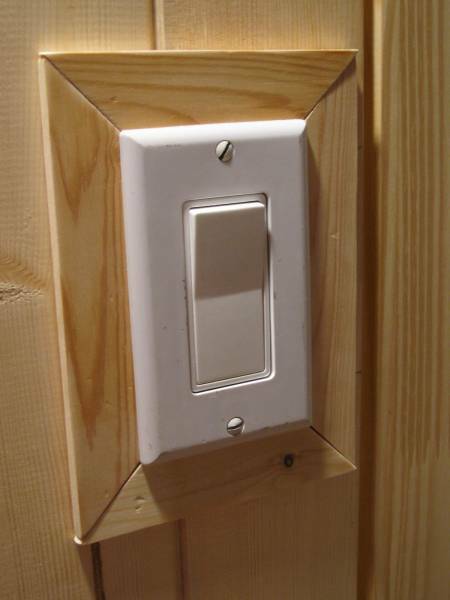 Graham trimmed around the light switch and outlets with wood. Trim work always pulls a renovation together. I want everything trimmed out – it looks so finished! He will put the trim up around the door edges. And I will sit down and figure out the custom shelves for the right hand closet. We have to get flooring eventually, although I am not in a big hurry for the floor to be installed. I’m just happy we have doors. We’re really happy with the way these closets are turning out. At least now we can keep the dust off the clothes. Read the last part of this building project. Part 3 of Loft Closet can be found here. Want to read about some of our other home renovations? We fixed this UGLY stairwell and totally changed the look. And…now I’m not afraid to go down to the basement. See how we totally updated our basement stairwell. 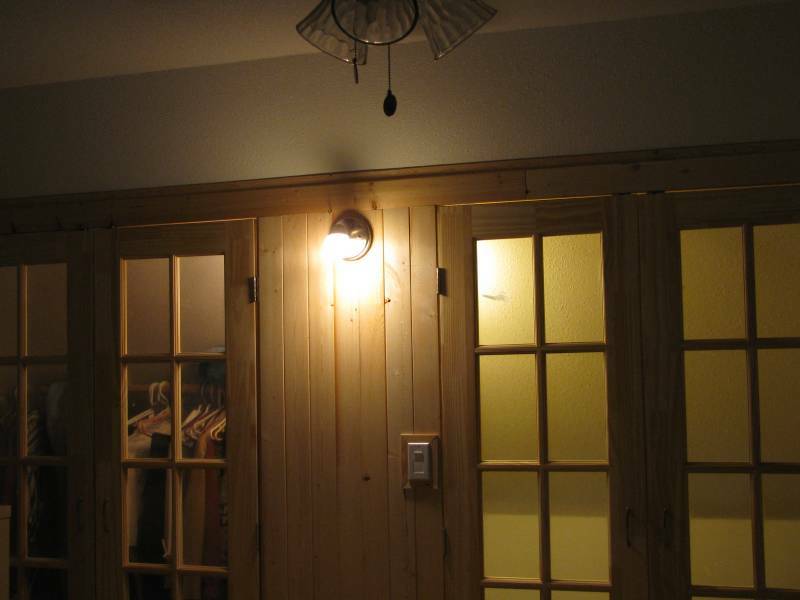 We got rid of that awful 70’s grooved wood paneling….without taking it down. Check out what we did. If you’ve got an ugly counter top, check out what we did with ours! We painted the counter top to look like granite.